Surprisingly low number for Switch (yeah, still shortages), but great debut for MK8D. Like I said in the other thread, lower than expected for Switch hardware. Assuming its still largely sold out, I suspect Nintendo will keep emphasizing the West until the 3rd week in July or so.. Surprisingly low number for Switch, but great debut for MK8D. 350 749 for Mario Kart 8 on Wii U, for those who want to make comparison. I didn't know media creates included fanboys. Great Mario Kart numbers. Surprised Switch didn't crack 100k in hardware though. Switch DOOMED. Nah, I just think they might have been too conservative as golden week was coming. MK8 did great considering the install base. It is still difficult to find over there? That's probably the reason it did not explode in the chart. Still sold out everywhere online, so it doesn't seem like it's a demand problem. edit: whoops, famitsu vs media create. Guess they just didn't ship enough units. Think it's more surprise Nintendo didn't try to ship more for MK8D's launch. it's the biggest title for a while. I guess they're holding back of Golden week maybe? Other Mario Kart games didn't launch so early after the release of the systems. 280k in 3 days of sales seems good to me. Other Mario Kart games didn't launch so early after the release of the systems. 280k in 2 days of sales seems good to me. I don't know if you can be underwhelmed by the Switch sales considering it selling out and outsold all other systems combined. Great to see BotW chugging along. What a game. Great debit for MK, and also Zelda benefit from it. Next week will be 400 retail on switch alone. Wow. MHXX too had another very solid week,helped by the very good dragon Ball result? At first 280k doesn't sound like much until you see there's a ~37% attach rate. Yeah, that's got to be it. Yup. It's&#8203; got to be. Lower than predicted numbers for Switch, but then, we were basing 100k+ on our gut instincts really. and they just don't have the stock to really push for a HUGE sales week right now. Maybe they did divert some stock to Japan, but the extra here is all they could manage. So what else could it be? Lol. Still out of stock all over Japan, so do tell. Do they count Sundays? Aren't shops closed then? And sorry, I fixed the chart size. Actually I expected lower sales for Switch, but higher for Mario Kart. Could it be the lack of Switch stock what made people not to buy it yet? If we see numbers above 100.000 next week, I will assume that. Pretty disappointing result from Gun Gun Pixies. Oh well. Compile Heart had a good run on Vita while it lasted at least. Nice for Mario Kart. And Dragon Ball. What other explanation do you have? That's been the case for the past weeks. Don't see how it would suddenly be fixed in an instant. Ugh that's what it is. You know just like Sony and the PS4 when it launched and nobody said anything? Third party support for Ps4 jeopardised, right? GAF analysts predicted 100K and its 75k so it's lower than expected. On this forum, lol. Let's see if the momentum dies in a few months because right now it's just going to sell whatever is available. Edit: for clarity, I don't think that's happening any time soon. Am thinking you'll get your 120k next week. Don't worry guys, Xenoblade 2 will save the Switch in Japan! Yeah, I wonder what led to it. Just a pre-golden week bump? Or did some software come out? eh what were people expecting Switch to do last week? With Splatoon 2 coming out in a couple of months that's going to be hard to see happening. What happened to the Vita? Thing dropped off so much. Don't worry. NIS will keep releasing great games for PS4 to build the Japanese userbase like Disgaea 5 did! So Zelda (WiiU+Switch) should be above 500K as of this current week going by these numbers. Nice! So a million is indeed reachable at this point considering holidays coming up and then Christmas. Bomberman R still climbing its way to 100K. Hope it gets it. 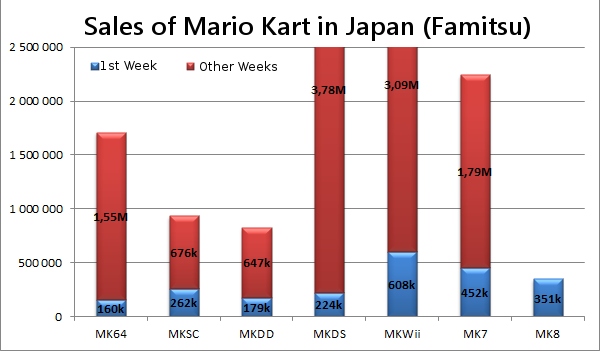 Also have to consider that Mario Karts tend to not launch in the same year as the system's debut, and that MK8 on Switch is more or less a port, plus a few new features, so millions in Japan already own that game on Wii U. Switch is clearly also still heavily supply-constrained, and I think sales for both the system and the game would've been quite a bit higher had everyone who wanted a Switch been able to get one. There's likely a lot of people who want Mario Kart but can't play it because they can't find a system. Nintendo is cranking right now! Minecraft can only do so much.